Champions Rustington are continuing where they left off last season following two impressive wins over the bank holiday weekend. New manager Kerry Hardwell’s side were 5-3 winners at Upper Beeding on Saturday then the Blues romped to an emphatic 7-0 victory over Ferring to make it three wins from as many matches in the SCFL Division 2 so far this campaign. Summer signing Josh Irish found the net four times as Blues were 5-3 winners in a thriller at Upper Beeding on Saturday. Blues were a lot more convincing as they dismantled Ferring on bank holiday Monday. 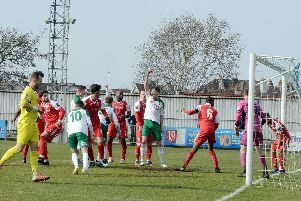 Irish made it six goals in two days with a double, Regan Miles also got two and Stephen Kirkham, Carl Bennett and Chris Darwin struck in the 7-0 rout at Glebelands. In-form Rustington host new boys Copthorne a week on Saturday.